"If we play like we have done in the last three league games, we won't be reaching any finals," Guardiola said. 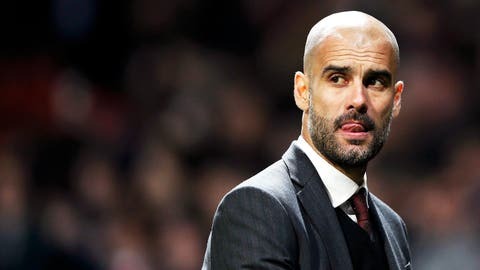 Bayern Munich manager Pep Guardiola has warned his players they have "no chance" of reaching a third successive UEFA Champions League final if they carry on playing the way they are. Bayern, having clinched a second successive Bundesliga title in record time three weeks ago, are on a downward slide, winning just once in their last five league games including back-to-back defeats either side of their European quarter-final victory over Manchester United. Guardiola, animated and anxious in his press conference ahead of their German Cup semi-final against Kaiserslautern on Wednesday, admitted his side are in a "dangerous situation" and need to recover quickly if they hope to match Real Madrid next week. "If we play like we have done in the last three league games, we won’t be reaching any finals," the 43-year-old said. "We have to quickly find our form back. We’re in a dangerous situation. If we play in Madrid like we have done recently then we have no chance. "Sometimes a defeat helps to improve a team. But when the focus isn’t there, then the head is slow and everything happens a slower. It’s been the same training, the same system, the same players." Bayern travel to the Spanish capital for the first leg of their semi-final on Wednesday 23 April hoping to repeat last year’s historic treble. Guardiola is also sweating over the fitness of goalkeeper Manuel Neuer who was substituted at half-time during Saturday’s defeat to Borussia Dortmund with a calf problem. The former Barcelona boss said: "He could not train today but hopefully he will be able to play tomorrow."